More good news for Mitt Romney & America. Coming down the home stretch! Hope and change are still what Americans are seeking. This time, Republican challenger and Michigan native Mitt Romney offers the best hope of changing the nation's fate. The Keynesian approach has not worked. Despite an $830 billion stimulus and increased annual spending, the economic recovery is the weakest in post-World War II history. Investors remain on the sidelines, afraid to put their money into job creating projects because of the uncertainty about future tax and regulatory policy. Had Obama done as well with the rest of the economy, it would be hard to deny him a second term. There is a good reason newspaper endorsements are on the opinion pages. They're opinions. What this paper printed was just factually incorrect and shows how effective the propaganda that "the stimulus didn't work" has been. 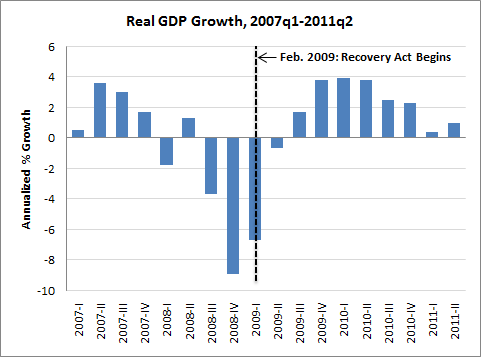 The stimulus did work and is confirmed by both the CBO and private economists. The problem that a $788 billion stimulus, spread over two years, with 40% tax-cuts, couldn't overcome a 9% drop in GDP. Of course it is, and you have your "opinion". And in their opinion, they are endorsing Romney. Let's face it...does anyone vote for a guy because a paper endorses him? On personal level, I don't think they do. However, when all these papers are endorsing Romney over Obama...it gives the nation the feel that everyone is heading that way. Polls be damned...I think Romney's Victory is going shock people. Sun Sentinel is owned by the right wing company, The Tribune Company, which also owns WSFL. It is in the middle of expanding beyond Broward County and trying to attract South Florida conservatives. It was a business decision, as typical for republican strategists.